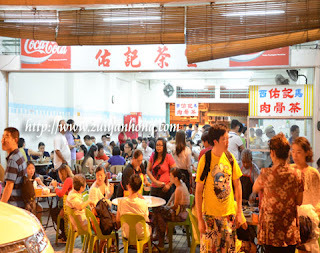 Yu Kee Coffee Shop is the most crowded eatery at Gaya Street of KK in Sabah. A photo speaks a thousand words. 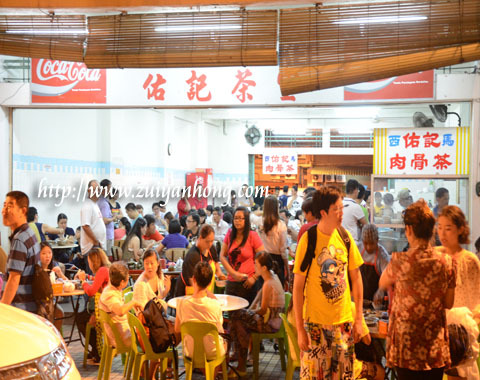 The well known bak kut teh of Yu Kee attracts hundreds of customers daily. This is the photo of Yu Kee bak kut teh. How's the taste of Yu Kee bak kut teh? Well it depends on your taste buds. I dare not to comment. If compare with the bak kut teh which I had taken before, Yu Kee bak kut teh is nothing special. Based on my observation, most of the diners are tourists from China. According the information from the locals, the KK city folks seldom visit Yu Kee Coffee Shop. It shows that the patrons of Yu Kee are mainly tourists.